Since the mid-1970s artist Matt Mullican (1951) has been active in the creation of a system of signs, images, and schematics that attempt both to order the world and to investigate the distinction between lived experience and objective reality. Mullican has obsessively produced maps, charts, banners, and collages; devised colour coded graphics to represent abstract concepts like death, heaven, and culture; and made reams of drawings of a stick called Glen, whose trials and tribulations function as a litmus test of images’ ability to evoke empathy. Taken together, these works suggest an attempt to create something approaching a complete image of the universe, which is tempered by tacit acknowledgement of such a quest’s quixotic nature. Mullican also attempts to pierce the depths of his own psyche in performances that he executes while in a hypnotic trance. 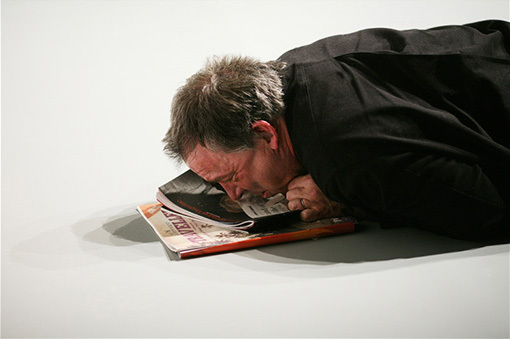 During these performances, he is overtaken by an alter ego, whom he refers to as ‘that person’ – an ageless, sexless entity that rises to the surface of Mullican’s consciousness, rendering to him as a mere ‘passenger’ of his own body, ranging from the mundane to the bizarre, frequently appearing to be in a state of psychedelic intoxication or even psychosis: he mumbles and huffs, hurls profane abuse at himself, rolls blissfully on the ground, chants and sings. He also makes filigreed abstract drawings and text-based works, whose content ranges from imaginary restaurant menus to bombastic declarations like ‘I love to work for truth and beauty’ – which he transcribes furiously on paper, bed sheets, and, occasionally on the walls of the performance spaces. The resulting works are frequently hung in dense arrays on the walls of labyrinthine environments, custom-built to form a rough cartography of Matt Mullican’s mind, in all its disorienting complexity.